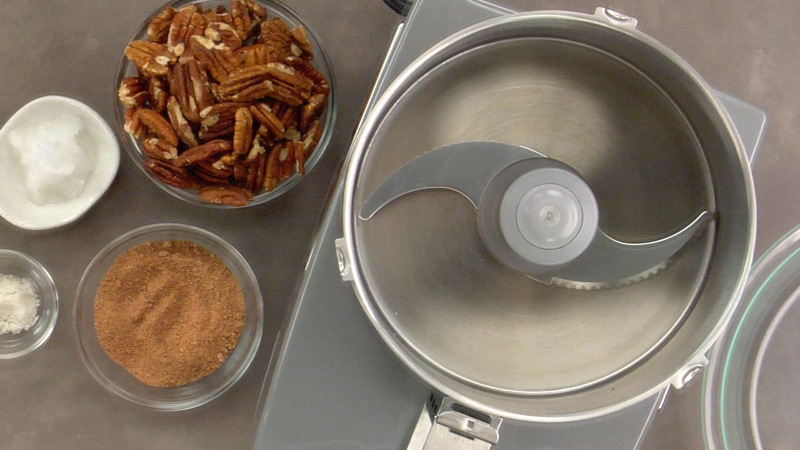 To prepare the crust, combine the pecans and sugar in a food processor fitted with the metal blade. Process until the mixture resembles a fine meal. Add the coconut oil, salt and optional chipotle powder and pulse to combine well. Transfer the mixture to an 8- or 9-inch pie pan. Press and shape the mixture into the bottom and sides of the pan to make a pie shell..
Preheat the oven to 350°F (175°C). Alternatively, the chocolate can be melted using a double boiler. Place the chocolate chips in a baking tray or shallow pan, Transfer to the preheated oven and heat for 3 to 4 minutes or just until melted. Watch carefully as the chocolate can burn quickly. Remove from the oven. While the chocolate is melting, combine the tofu, vanilla and salt in a food processor fitted with the metal blade. 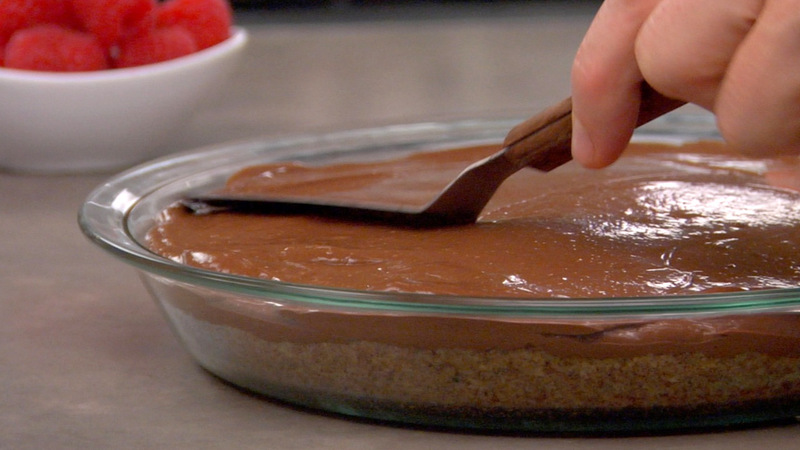 Add the melted chocolate and blend until very smooth. *Note: For the tofu, if you cannot find firm silken tofu, soft block tofu can be used instead. In this case, the tofu often comes in 150 gr or 300 gr packages — we have tested this recipe using 2 x’s 300 grs (600 grs total) and the end result was delicious. Pour the mixture into the reserved pie shell, smooth the top with an offset spatula and refrigerate for at least 20 minutes or until firm. When firm, slice and serve.. Note that soft, medium or firm silken tofu can be used in this recipe, but for a final product that is a bit more dense, firm is recommended. For more information, here is an article called "A Guide to Tofu Types & What to Do w/ Them. Hi Rouxbe, I would like to ask what brand food processor you arr using here? I have never seen a food processor like this one. Can you also tell me why this model has a hand crank and what its purpose is? It looks like a great processor to own and use! Hi! Is the date sugar the same as the date paste, the home made sweetener that you make by mixing dates with water? Or is date sugar something that needs to be bought in stores? Thanks! Maybe I can replace date sugar with date paste? Would I use the same quantity? Can I substitute sugar or maple sugar for Brown sugar? Can stevia be used in place of sugar? Wanting to keep sugar very low. Hello i would like to know if the coconut oil can be substituted with another type of oil? Thanks, Kirk. Looking forward to the class! Hello! I would like to know if this recipe can be frozen. Any idea if it would keep its taste and consistency after a week in the freezer?? Can I replace the pecans with hazelnuts or will it effect the consistency of the crust? Allergic to soy. What is the substitute? Ok, I used hazelnuts instead of pecans and ended up using some bitter sweet chocolate chips because someone ate half my semi-sweet chocolate chips, but it came out really, really good! I also topped it a bit differently. ^_^ Pictures here https://www.instagram.com/p/Ba0qOkFA1FX/ and here https://www.instagram.com/p/Ba2it1wgicK/ For any Rouxbe staff, I'd appreciate knowing if I can share the recipe on social media. I've tagged you in both of the picture posts. Thanks Chef Kirk! Looking forward to the upcoming class! Is there a link to make vegan chocolate chips? Made the pie using Lilly's dark chocolate chips with stevia. Awesome recipe. I enjoyed making the pie and enjoyed eating it even more. So it’s not a good idea to use almonds instead of pecans in this recipe? This was so easy to make and turned out very well. It was delicious. I did not have pecans and used walnuts instead the crust held its shape and tasted great. Yummy! This is the recipe I've made more than any other recipe in the course so far. Each time I make it everyone falls in love with it! I've shared the recipe with so many people, I lost count. I'd like to share that I do two things differently: one is that I halve the recipe but use the same size pie pan, which gives ma a very thin and elegant pie. Each layer is about 13 mm thick; the whole thing is about 1 inch in thickness. It looks lovely, and of course tastes divine. 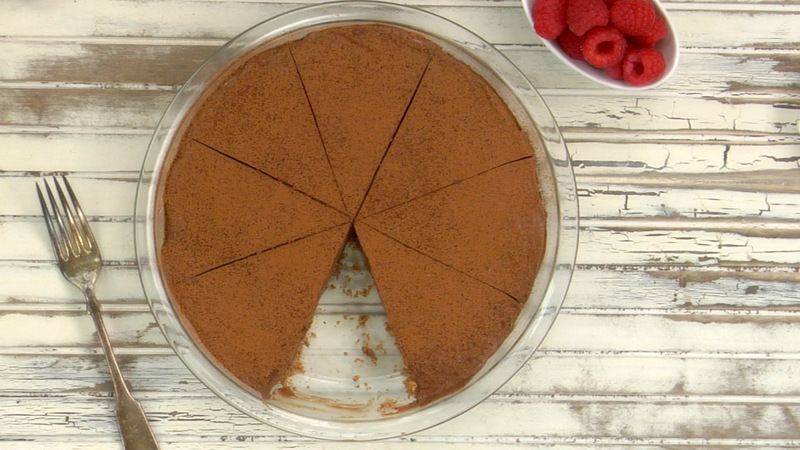 This way, I enjoy a slice without feeling "stuffed" and sometimes go for a second tiny sliver. The second thing is that I use a good quality vegan chocolate bar, as high a cocoa content as possible without being too bitter. I melt it in a double boiler and continue the rest as in the recipe. Thanks Rouxbe Team for these brilliant recipes!